The LaserHybrid welding process satisfies the stringent requirements of large-volume industrial series production, both for thin sheet metals and thicker materials. 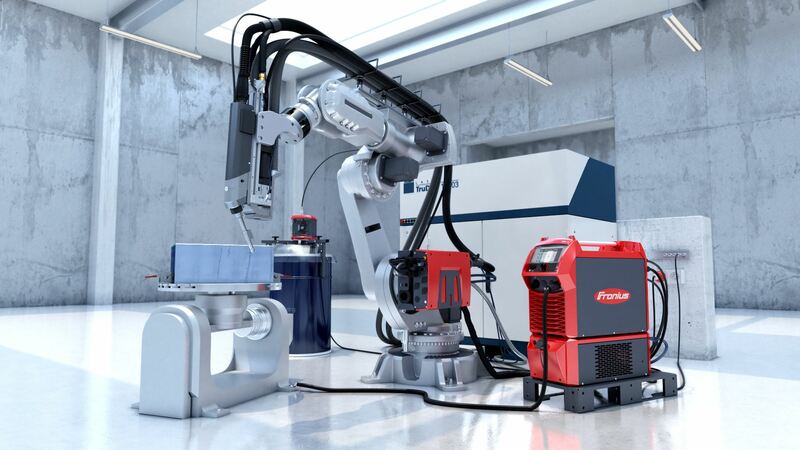 The process guarantees maximum productivity thanks to extremely short welding times. The low overall weld seam costs involved in using LaserHybrid guarantee a high level of cost-effectiveness during series production. The combination of a laser and a conventional MIG welding process brings together the positive aspects of both worlds: the combined effect of laser and GMAW processes produces a highly stable welding process with a good deposition rate and high level of thermal efficiency. The laser ensures high speed and narrow, deep penetration. The low heat input prevents distortion of the component. Gas shielded arc welding involves filler material and therefore has an excellent gap-bridging ability, eliminating the need for time-consuming seam preparation. 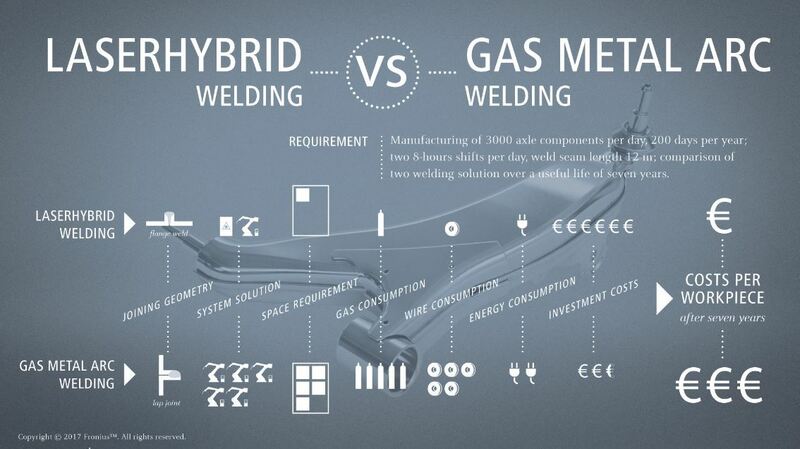 Users also save time on reworking, as the LaserHybrid process reliably produces error-free welding results. 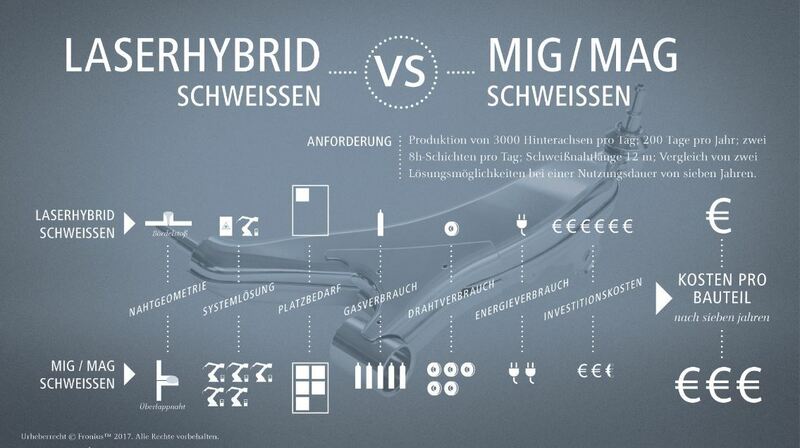 The LaserHybrid process therefore makes an important contribution to reducing production costs. The process is used whenever there is a need for fast welding speeds and maximum productivity, be it working with thin sheet metals or in the series production of automotive components, or when welding long shipbuilding sheet metals with a thickness of up to ten millimeters. Depending on the material thickness, a welding speed of up to eight meters per minute can be achieved. The compact LaserHybrid head with integrated MIG/MAG welding torch and laser optics is the core of the system. 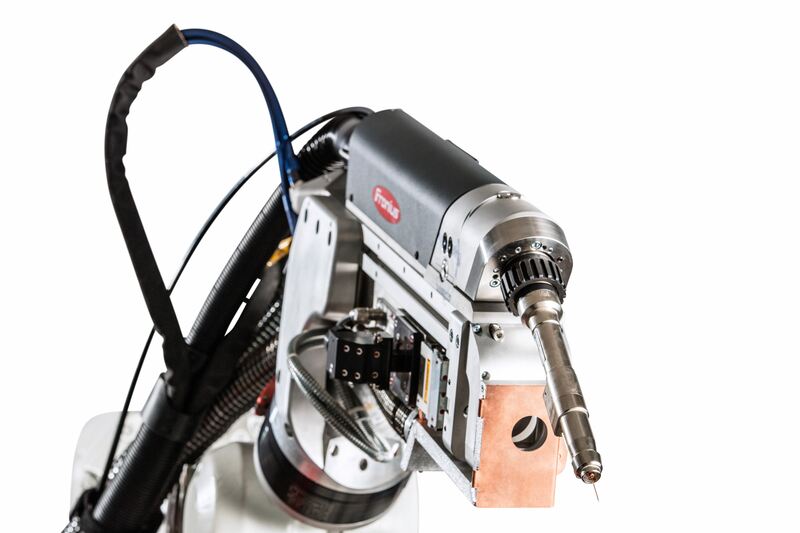 The LaserHybrid head can be connected to a commercially available industrial robot via a specially developed robot support. This enables the LaserHybrid head to be flexibly adjusted in order to reach difficult to access component segments. The CrossJet unit developed by Fronius uses air flow to protect the laser optics against contamination from spatter or welding fumes.